The expected, rapid expansion of solar systems installation will result in excellent job opportunities for qualified individuals. Targeted local policies and continuous cost decrease will stimulate the residential and commercial sectors to take advantage of these systems, leading to a greater demand for the workers who install them. Furthermore, the interested parties (manufacturers, developers, investors) seek skills certification and or quality assurance in all phases of a PV installation (design, installation and maintenance). Being properly certified and licensed is one of the most important things installers can do. At the same time, the increase of qualified workforce requires an increased training quality and relevance. Within MED-DESIRE - the EU funded cooperation project involving Egypt, Italy, Lebanon, Spain and Tunisia - specific capacity building actions have been planned concerning certification/qualification schemes of training courses. The ongoing, certified course for Training of trainers of solar photovoltaic system installers in Beirut (24-28 August) is a pilot action carried out by the Italian partner ENEA, in collaboration with the Lebanese Center for Energy Conservation (LCEC) and the Industrial Research Institute (IRI). 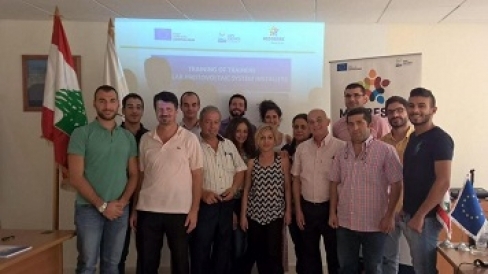 This course is attended by teachers nominated by the directorate general for vocational and technical education in Lebanon from official vocational schools throughout the country aims at being the first step towards the integration of photovoltaic system installations within the official Lebanese curriculum. The training is aimed at the formation of knowledge, abilities and skills relevant to the implementation, verification, management and maintenance of photovoltaic systems and subsequent verification of knowledge, skills and competencies relevant to the activity of the installer of photovoltaic systems. This course is performed under the supervision of an international certifying body for the solar industry. A “certified trainer” ensures quality and competences in performing specific education activities, being beneficial both for students and educational providers. Fifteen trainers took the course and will be assessed on 15 and 16 October 2015 before receiving their certification. Once obtained, a certification must be maintained and certified solar professionals must keep their knowledge updated.